Our right is to return, and definitely we will. 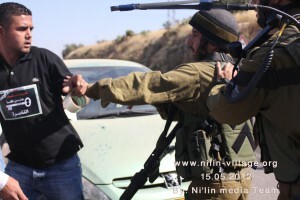 Last Tuesday, in an event named “Historical return demonstration to Al Ramleh city” dozens of young Palestinians successfully broke through the Ni’lin military checkpoint on the morning of Nakba Day. The unannounced event gathered 50 activists that together marched towards the checkpoint separating the village from Palestinian lands occupied in 1948 and 1967. Later in the evening a second protest was held in Ni’lin as the villagers marched towards the apartheid wall separating the village from its olive groves. The demonstration was attacked by Israeli soldiers hiding under camouflage covers in the fields. The soldiers chased the protestors towards the village but did not manage to make any arrests. Two people were however injured by rubber coated steel bullets. This entry was posted in Occupation and tagged Nakba, Occupation, Palestine. Bookmark the permalink.